Today we are speaking to Joe Wilson. 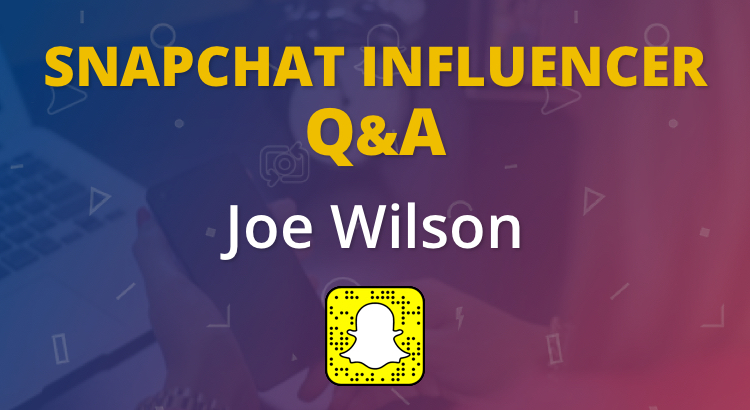 Joe is a storyteller who uses Snapchat to engage with his community. In the interview he talks about how brands can utilise the storytelling aspect of Snapchat, advice for beginners and Frozen Snap Friday. Hi Joe, great to meet you. Thanks for taking the time to share your knowledge with us. Could you tell us a bit about yourself and what you do? I am a storyteller based in Los Angeles and I’ve created a couple live-action series and a graphic novel series, all indie with the help of a community of cool online neighbors. Like all social media platforms, I think Snapchat is an opportunity to tell the story of a product or service, humanize the company or brand, be accessible, be real, be human. Tell a story that isn’t about selling or marketing. If you’re an infomercial on social media, you will fail because people have too many options for their attention. A swipe or a tap and you disappear. Could you tell us about Frozen Snap Friday? Frozen Snap Friday is about one thing, having fun. A frozen snap is when you don’t move or blink, to the best of your abilities, for the full ten seconds. It’s funniest when there’s someone or something moving in the background. It was an idea I stole from a 1982 sitcom called “Police Squad” that would close each episode with the actors freezing in place while the credits played over them. At first, Frozen Snaps were a response to Chris Strub’s “one take snaps,” which are snaps you screw up but post them anyway to show you make mistakes, you’re real, you’re human. My online neighbor, Chris Baierman, suggested making frozen snaps a thing we could all do on Fridays. After a few weeks of Frozen Snap Friday, I started asking people to email me their snaps, which I use to make a mashup video every week. This is the 25th week of making the mashup video. Recently I started throwing out ideas for FSF, like backwards frozen snaps, or ones with pets or animal lenses and this week we’re all wearing hats. Watch stories and, like a new neighborhood, see what your neighbors are doing on Snapchat. There is no Snapchat community, there is your community on Snapchat. And also like a neighborhood, say hi. Be a good neighbor. Give it time for things to grow. It will take time and there is no way to automate or fake Snapchat and that’s what makes it a valuable social media platform. What you do for one person watching will be very similar to what you will do for thousands watching. Give people a reason to give their attention to you and don’t waste their time. Snapchat has given me a place to tell stories, do characters, sketches and have fun that, for me, doesn’t exist on other platforms. I did stand up comedy for years and learned you can’t make everyone laugh. The great thing about Snapchat being a place to tell stories is that everyone watching is choosing to spend their time with me and that is something I do not take lightly, especially when there’s so much to watch. Because of what I do on Snapchat, I’ve had more people checking out my work, buying my graphic novel and my wife, KZ’s art. I’ve also made a lot of real life friends on Snapchat and have met many of my online neighbors! There’s a bunch! Here’s a few @ChrisStrub @ortizramon77 @LanaLakke @Baierman @njrish @dumbodoggies @cheflizette @chelsea.peitz @jackiekashian @[email protected] @sheilascruggs. I’m @JoeWilsonTV on Twitter, IG, Snapchat, FB and Periscope. Song Request Cage Match (https://www.periscope.tv/joewilsontv) is a two hour show I do on Periscope every Wednesday 7:15-9:15pm EST / 4:15-6:15pm PST where I play requests, which that audience votes on and I do a drawing every week. Classic Movie Salon (ClassicMovieSalon.com) is a show I co-host with CollCostello, @Tachiada, & @HistoryNeedsYou S where we all watch a movie before the show and then get together to chat about it, with many tangents! Classic Movie Salon is Sundays 5-7pm EST / 2-5pm PST / 10pm-12am UK. It’s not about the social media platforms, it’s about the people. Thank you, Joe for taking the time to share your knowledge and opinions on using Snapchat. To connect with Joe on Snapchat, scan the snapcode at the top of this article. If you enjoyed this interview, please check out more in the Snapchat Influencer series.